How come my computer cannot connect with my camcorder? In Compressor 2.0, all Apple’s supplied presets seem to have Field Dominance set to "Top First" (aka "Upper Field First"), as you can see here. I went through a few and they were all set this way. Since DV camcorders capture video lower field first, FCP capture presets and sequence presets are lower field first, as they should be, so interlaced fields proceed in order. However, when encoding video with Compressor, the field order is reversed, leading to very unpleasant, very jittery motion in the MPEG2 file (or H.264 or whatever). 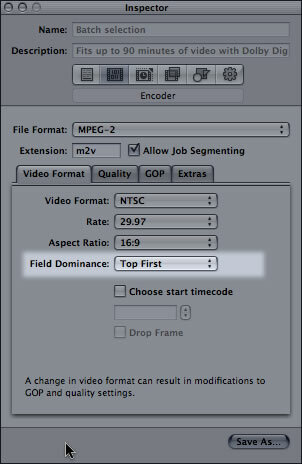 If you are encoding MPEG2 for DVD delivery, make sure you create a custom preset with Field Dominance set to "Bottom First"–otherwise your DVDs will be painfully, horribly jittery. My version of Final Cut Pro can not capture HDV footage. So I’ve used iMovie, and later inserted the footage captured with iMovie into Final Cut. When exporting this to mpeg for DVD burning, the video would always turn out jittery. However, I finally found the solution on Apple’s website, which is the “Shift fields” filter. Thought I’d mention this because myself I had a problem similar to the one addressed in this excellent article (jittery image when playing a DVD on a television with footage that originally came from a HDV camcorder) – but in my particular case, the solution mentioned here (changing field dominance in Compressor) did not solve my problem, probably due to the fact that I had used iMovie to capture it. HDV footage of what flavor? Interlaced or progressive scanned HDV footage. Part of the issue may be that HD & HDV footage have various frame rates that are not 29.97. This is not true for progressive scanned HDV footage as there are no interlace problems. This is part of the reason that we totally avoided any HDV that is interlaced. Not only is the spacial resolution less, but being a film guy I prefer a frame to be a frame. I’m not sure that iMovie is the problem as it should not be changing the frame rate of the raw footage unless you are exporting the footage. That is an entirely different matter in that QuickTime will allow you to change frame rates. If you open the file to be compressed in QuickTime Pro you can also turn on High Quality and Single Field. Not always the best choice, but with some video it may be the only option. We’ve also had to create custom settings in compressor specific to issues with individual videos – fast motion, etc. – changing the data rates, order of I-P-B frames until we acheived optimum results. “Jitter” or flutter in an image can be caused by more than problems with interlacing. We’ve had problems with HD video that was only apparent when effects were applied or when it was compressed. Our issue has come in the form of incompatible shutter speed combined with the flicker from non standard film light sources mixed with motion picture lighting (flourescent, high/low pressure sodium). We shot in a large area at night and some of the generators did not have proper regulators, so during compositing or in disolves, some images would flicker in some parts of the frame. FCP Project: DVPAL48Khz-upperfieldfirst. I placed this video in a Sequence set to the same as the project, edited it, rendered it. Where multiple effects+slow-mo was applied–I exported the video as QT and replaced the footage with it in the sequence. Finally–using Compressor, I encoded it to Mpg-2 (trying both Fastest encode & Best quality). The 48min film plays fine on the Mac LCD monitor. But when playing back on a Pal CRT monitor I get the dreaded frame jitter. Its worst in the slow-mo sequences (despite motion blur applied). I’m trying the following solutions and will report back if either of them worked. 1. Render as Uncompressed-8bit-Upperfieldfirst Quicktime Mov. Use iDVD to encode and burn the DVD. 2 Import the same QT into Adobe After Effects. Use Re-interpret Footage to set upper field first. Then re-render. Then import into FCP before using Compressor to Encode and Toast to burn the DVD. Am I still doing something wrong? Please help. I have a Canon HV-20 and when I try to import the footage into iMovie or Final Cut Express the video is flickering – Please Help. Oops – sorry – new to site – there is a whole thread I opened on this on apple support – may be of interest to readers stumbling upon this page through google as I did.